Sales of recreational marijuana in the nation’s two largest and oldest adult-use markets – Colorado and Washington state – eclipsed $1.5 billion in 2016, rising a combined 66% from the previous year. The figures highlight the massive growth potential for the rec side of the cannabis industry, which is still in its infancy. But they may mask the growing difficulties of turning a profit as the competition increases by the day. 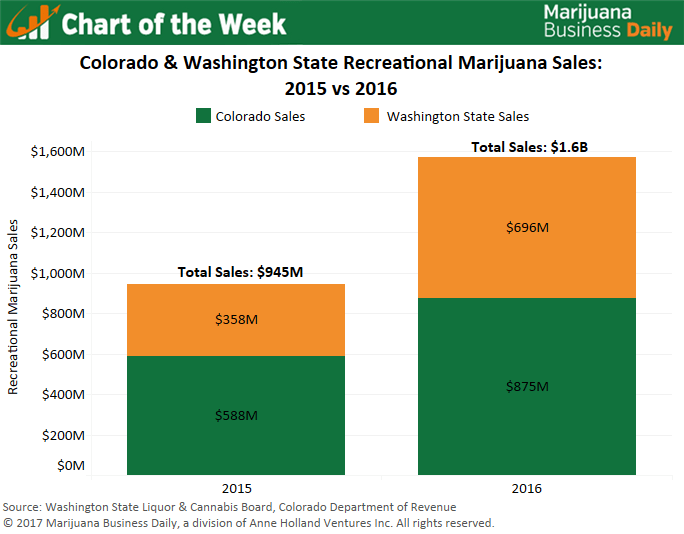 In Washington, adult-use sales for 2016 nearly doubled from a year earlier, increasing 95% to $696 million. While much of that growth was organic, the recreational market received a big boost when the state eliminated all medical marijuana dispensaries last summer. In the month after that transition, rec sales surged by more than $10 million, up 19% month-over-month. Average monthly sales growth in 2016 before July was 6%. In Colorado, recreational marijuana sales approached $900 million in 2016, up 49% from 2015. Although that’s smaller on a percentage basis than the growth in Washington, Colorado’s rec expansion is equally impressive given that the state still has a completely separate medical cannabis market. Adult-use sales in Colorado also were much larger heading into 2016 than they were in Washington, making it more difficult to post huge percentage gains. Though recreational sales are rising, new businesses looking to enter these markets face significant challenges. Wholesale marijuana prices have been falling in both Colorado and Washington, and retail prices have dropped because of huge increases in the number of infused products companies and retail stores. As the recreational industry has grown, so too has the number of businesses serving the market. The growth in new businesses has kept pace with – or, in some cases, exceeded – the growth in sales, making it harder for any single business to profit. Looking forward, both markets are likely to continue growing, though it remains to be seen how long they’ll be able to sustain such explosive growth. I’m not sure I get the math of “…As the recreational industry has grown, so too has the number of businesses serving the market.” As a WA producer, yes, wholesale prices are dismally low. Yet increased retail stores help the producer sell at a higher price (more demand). In addition, only a lingering few new producers and processors are coming online from the finite number of applications granted in 2013. What does substantiate the article quote is that existing producers who are doing well are also now creating efficiencies to increase the pounds of product yielded from a fixed canopy allotment.